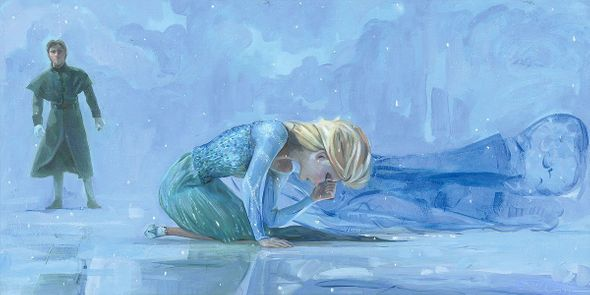 Home | Disney and Animation Art | Disney Feature Films | Frozen | Jim Salvati Signed and Numbered Limited Edition Hand-Textured Giclée on Canvas:" The Coldest Day" OFFICIAL | Gallery Direct Art | 800-733-1144 Free Ship. No Tax. Jim Salvati Signed and Numbered Limited Edition Hand-Textured Giclée on Canvas:" The Coldest Day"
He describes his style as "painterly realism", and his favorite subjects are people. Ask him about a painting, and he will tell you the subject's personal story.ï¿½ Salvati sees his paintings as his portal into various cultures and different areas of society. "I like the connection between people and their culture," he says. "The different emotions, gestures, moods, environments, and style of people in my life and those that I cross paths with, all become part of my storytelling". "Even with my Disney art, I think it's important to show who a person or character is and what is the most interesting part of their life the part that is bold and has guts. "ï¿½ Character and boldness can be observed in the scenes that Salvati chooses to depict. They are often not only a defining moment of a film, but usually the most emotionally charged and sometimes heartbreaking. Bambi alone in the woods, the Huntsman with Snow White, and Scar leaving Simba in the canyon, are all turning points in the story, and when the main character had to show their "guts" or courage. Home | Fine Art Prints & Limited Editions | Collectors Editions | Disney Fine Art | Jim Salvati | Jim Salvati Signed and Numbered Limited Edition Hand-Textured Giclée on Canvas:" The Coldest Day" OFFICIAL | Gallery Direct Art | 800-733-1144 Free Ship. No Tax. Home | Disney and Animation Art | Disney Fine Art | Jim Salvati | Jim Salvati Signed and Numbered Limited Edition Hand-Textured Giclée on Canvas:" The Coldest Day" OFFICIAL | Gallery Direct Art | 800-733-1144 Free Ship. No Tax. Home | Disney and Animation Art | Disney New Arrivials | Jim Salvati Signed and Numbered Limited Edition Hand-Textured Giclée on Canvas:" The Coldest Day" OFFICIAL | Gallery Direct Art | 800-733-1144 Free Ship. No Tax.